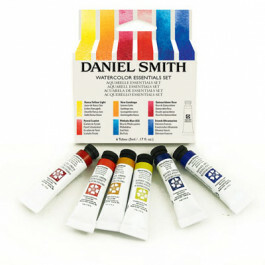 The new set has six x 5ml transparent watercolours. The pigments were carefully selected to give you a wide range of colours and values. When mixed together the colours you can create are endless! The Essentials set contains Hansa Yellow Light, New Gamboge, Quinacridone Rose, Pyrrol Scarlet, Phthalo Blue GS, French Ultramarine in 5ml tubes. so you have both cool and warm Yellows, Reds and Blues.